A good laugh for your kids birthday parties! Clowns have always been popular with kids. The combination of outrageous and colourful costumes, slapstick comedy, and the famous clown happy face make children laugh no matter what age! Bingo the Clown will get your kids pumped to have their own clown party! Is a clown right for your next kids' party? Have your kids ever been enthralled by clowns at the circus? If they have, imagine their delight at being surprised with a visit from a clown at their next birthday party! Clowns can be a great choice for kids' parties because they keep the kids busy, get lots of laughs, and interact with the little guests. A clown can make even a shy child collapse with laughter. They're suitable for indoor and outdoor parties, so a clown might be a good choice if the weather is uncertain. Some children are afraid of clowns, particularly if they are very young and haven't encountered one before, so it is important to make sure your child isn't going to become distressed at the sight of their larger-than-life surprise guest. Kids who are very quiet and sensitive might need to be introduced to clowns beforehand at a community event or a circus to gauge their reaction. Not sure if you can afford a clown? Rates for professional kids' clowns usually start at around R500 to R700 an hour. This cost includes games, activities and a show. You can find kids' entertainers online or ask some of the parents you know for recommendations. Make sure your home has enough space for all your guests, plus whatever kids' activities your clown is planning. Alternatively, many kids' party venues are happy for entertainers to visit. Not sure if a clown is what you want? 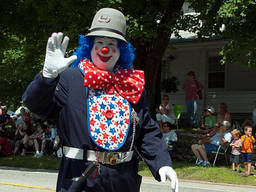 Most kids' clown entertainers have a number of personas and can be pirates, cowboys, magicians, and anything else you or your child can think of. A little clowning around can be good for kids and adults alike. Why not invite a clown to your next party?